Children are organic mourners. Adults are the barometer for how children will handle death, therefore, the healthiest way to help a child adjust to the death of a pet is to give them honest, simple explanations. Show them that it’s okay to be sad and allow them to do what comes naturally to them. From a young age, children begin to understand the concept of death, even though they may be unaware of it at a conscious level. “Any child old enough to love is old enough to mourn,” says Alan Wolfelt, PhD., world-renowned grief expert. When a pet is dying, it may be more difficult for a child to resolve the grief experienced if the child is not told the truth. Avoid phrases like put to sleep, God needed an angel, or a special shot. All of these statements can be conflicting for a child and emit fears when they go to bed, go to church, or see the doctor for a shot. Support children and their grief by acknowledging their pain. The death of a pet can be an opportunity for a child to learn that adult caretakers can be relied upon to extend comfort and reassurance. It is an important opportunity to encourage a child to express his or her feelings. 1. Allow the child the opportunity to see the deceased pet and to say their final good-byes. Respecting the time that a child has spent with a deceased pet by letting them have time for a final good-bye will do wonders in the child’s grief journey. 2. Allow the child to express their sadness. It’s okay for you to show your sadness too. Let them know it’s okay to cry. It’s okay to be sad. 3. Help the child with ways that they can honor their pet in death. 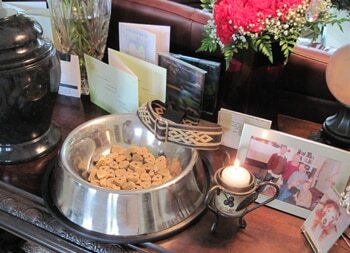 Have a memorial service for the pet and allow the child to be a part of creating the ritual. Some pet insurance plans may even help pay for burial and cremation. 4. Create a Tribute Table. Start the ritual process with the creation of a Tribute Table, a table that is set up in a prominent part of the house holding items that represented the life shared with the pet; items such as the pet’s food bowl, favorite treats, flowers, photos, toys, pet clothes, blanket, letters written to the pet or about the pet, and anything else that the child and the family feels would represent the life shared. This table would then become the focal point for the memorial service. 5. Allow the child the opportunity to assist with the memorial choices. Let them help choose the urn, a special rock that can go in the yard, or even a necklace or key chain that they might have with them at all times, possibly with a bit of the pet’s fur enclosed in the piece. Also, make sure that each child is given the opportunity to have, or create, a clay paw print of the pet and to have their own special fur clipping. Above all, be open and honest with the child regarding the death. As adults, it’s not our role to shield them from the loss but to give them the permission to grieve and honor the life they, too, shared with their pet.